GO FOR IT will guide you through some tough decisions you have to make as an entrepreneur and take you on a journey through the highs and lows of a being your own boss. "So, keep walking. Enjoy. Experience the joy of doing something meaningful. Oh, and by the way, it's now time to GO FOR IT and do what you love the most!" Matthew Martino born 27 October 1992 is a British Entrepreneur, Film Producer and Author. Educated at Shenfield High School in Brentwood , Martino has always held a passion for writing - He has always focused on educational writing and research. His first book Lets Fly which was published by DM Aviation was well received by pilots and aviation enthusiasts around the world. 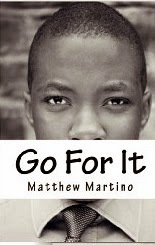 During his early years Martino showed all the qualities required to maintain proven success. Martino has lived in Brentwood ,United Kingdom for seven years before which he lived in his hometown of Bulawayo in Zimbabwe.